RG Herald: College Tech Campus sends Invite to Starr Co. "Ladies"
College Tech Campus sends Invite to Starr Co. "Ladies"
Want to be treated like the queen you are while learning about fabulous career opportunities? 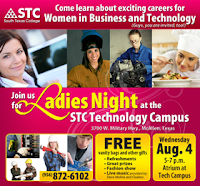 Then take advantage of Ladies Night at South Texas College’s Technology Campus located at 3700 West Military Highway in McAllen. On Wednesday, Aug. 4 from 5 to 7 p.m., all Valley ladies are encouraged to attend a special, free evening of live music, fashion, refreshments and career exploration. All attending ladies will get the royal treatment at the event, including receiving a free vanity bag. Attendees will also be entered into drawings for a variety of great prizes. For more information about the event call 956-872-6102.